Saturday morning, I went to a "Summer Fling" at a local church and got some great thrifty finds. (Stay tuned Thursday!) I wore these magnificent sandals which were a gift from my friend Eva. She found them at Frenchies for $6 and showed them to me. When I tried them on, she declared that my feet were much prettier in them than hers and that I should keep them. I never look a gift Czech in the mouth! Thank you Eva! I adore them. Sunday was pretty special. I met up with my darling German student from last year, Nadine and her parents. They're visiting NS for a few days. So we spent the day at Peggy's Cove where Nadine and I shot the new "Jump for Joy" summer edition photo. We stopped at Queensland beach and had a scrumptuous picnic: strawberries, chocolate brownies and do-it-yourself sandwiches with fabulous cheeses! They wouldn't believe me when I said that I don't swim in the ocean until August; they had to dip their own tootsies before they would admit "De-feet"! 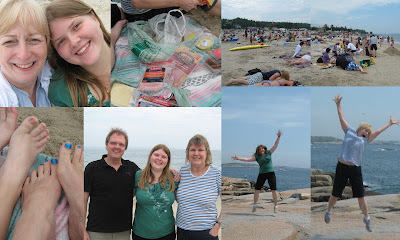 We drove from Peggy's Cove all the way back to Bridgewater via the old highway, and all the beaches were filled to capacity. Nadine's Mom was quite taken with the many Adrondak chairs she saw on decks and in gardens; and every time she saw a sign that mentioned lobster (and there are a lot of them on the South Shore), she would repeat it out loud. I think we have a seafood lover in the family! What lovely people they are and both have such a great sense of humor. We had a lot of fun together. But why, oh why, did they have to bring me ginger marzipan and a Lindt chocolate selection I've never seen before? And just where has it gone already? hahaha! Love the name of your blog and it's description! I feel the same way! I have to follow! Burp! You crack me up! I love your toes in those sandals. They definitely belong on YOUR feet. So wonderful that you could meet up with your previous students. It sounds like you were showing them a wonderful time. Those are the prettiest sandals I've seen in a while. Good ol' Frenchy's. And your toe nails really add to the cooridnated look. I'm loving your new header photo too! Great shot! Sounds like you had a delightful day along the coast. It's so pretty down that way. Love the photo of you on your header. It looks so "free spirit" and I love that. Oh I would have loved to be along on your trip to Peggy's Cove, Queensland Beach and down the old highway to Bridgewater. I sooo miss the ocean out here in Alberta. And the fresh lobster of course. Great shoes - hmmm, Summer Fling in Pentz, perhaps? We went in the afternoon since we had to go to Riverport for Fireman's breakfast - mmm, bacon. Didn't buy anything, but had an amazing strawberry shortcake! Sounds like you had a fabulous day - one of my favorite drives is Bridgewater to Peggy's Cove along the old highway, with added diversion around Blandford and Bayswater Beach. I loved this post. Brought a smile to my face, which I needed this morning. Would love to live somewhere exotic and not in dreary Ohio. We do have things to be proud of but today it's dark dreary and storming, again. What a great shot of you at the top. It says to me, I'm shooting for the stars! The sandals and polish caught my eye and that's why I read the blog! Thanks for sharing. Great friend who gives us shoes. And, I LOVE those shoes.... so zippy! I read your comment on Sweet Tea and your name intrigued me. I see a couple other friends here as well. I loved your post today - and I would be in the same position as you with the candy! "ginger marzipan and a Lindt chocolate selection" - this plus the sandals made you a very lucky lady. Be careful or your feet will get fat! Sounds like a perfectly wonderful day, Sandy! 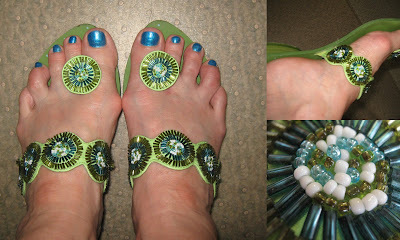 A new header photo, rockin' blue toe nails, and funky sandals. Beauty is all around! !